You are here: Home » OTHER NEWS » Performance in Memory of Kazani: Pay Tribute to all Victims! Performance in Memory of Kazani: Pay Tribute to all Victims! 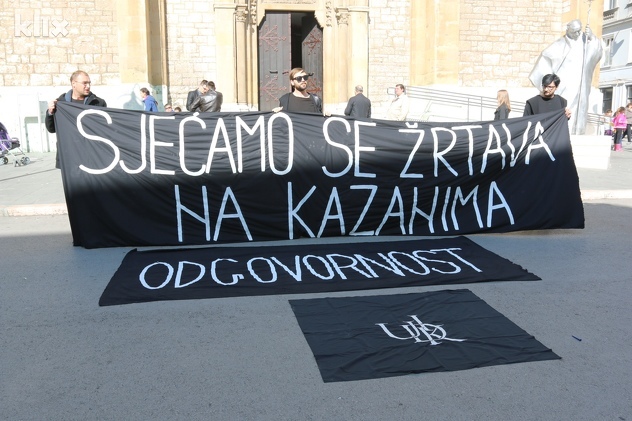 Members of the Association for Social Research and Communications (UDIK) today held a performance in front of the Cathedral in Sarajevo, drawing attention to the victims of the crime at Kazani, about which many remain silent up to this day. “Sarajevo is primarily a city of Bosniak victims, but with this performance it was shown that it is also the city of other victims. Our aim is to finally accept responsibility for what happened 23 years ago, and to somehow show solidarity towards the victims and their families”, said the coordinator of UDIK Edvin Ćudić. This is the second performance that UDIK held in Sarajevo, and it was highlighted by the Association that it was not talked much about Kazani before that. “Performance form 2014 launched a series of initiatives of governmental and non-governmental sector for marking of this crime, which was our primary objective. Unlike last year when a low number of people attended the performance, a large number of citizens expressed interest in showing solidarity towards the victims of the crime at Kazani this year”, Ćudić explained. As a reminder, the Sarajevan civilians were brought and killed during 1992 and 1993 at the locality of Kazani near Sarajevo. Exact number of victims is still not known, and remains of 29 victims were exhumed from the pit at Kazani after the war. Until now, 14 soldiers of Army of B&H were convicted to sentences from 10 months to six years in prison for the crimes at Kazani.